It has been confirmed – when the newly announced 27″ Apple LED Cinema Display hits the market later this September, you won’t be able to get hold of the older models any more. We’re talking about the end of the road for the 24″ and 30″ models, so those who want a larger viewing real estate might want to snag the latter at the moment while stocks last, otherwise you will just have to make do with the 27″ model when it arrives. What does the new Cinema Display offer, you ask? Well, for starters, it delivers a stunning 2560 x 1440 resolution as well as 60% more screen real estate than its 24″ predecessor. 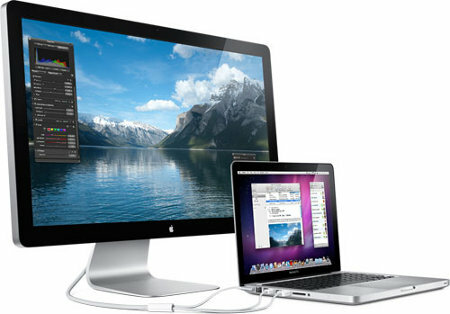 Not only that, you will be able to think of the various possibilities with its built-in iSight video camera, microphone and speakers, a powered USB 2.0 hub for added connectivity options, and an universal MagSafe connector, making the new LED Cinema Display an ideal companion for the MacBook family or a Mac desktop. Priced at a cool $999, this is definitely not a model for those who are on a limited budget. After all, at that price point, you can already purchase a working, entry level desktop machine which runs on Windows, but it is quality that you’re getting here. Boasting a beautiful 16:9 edge-to-edge glass display alongside an aluminum stand, you will also get an adjustable hinge which makes tilting the display almost effortless. The LED Cinema Display will also deliver vivid colors and exceptionally high contrast, thanks to the implementation of a premium display technology known as in-plane switching (IPS) that offers a brilliant image across an ultra wide 178 degree viewing angle. It is nice to know that the new LED Cinema Display sports a new ambient light sensor which will automatically adjust the display brightness based on external lighting conditions, helping you save power in the process whenever you work in a well lit area. It also has a heart for the environment, thanks to its construction using mercury-free LED technology, arsenic-free glass and highly recyclable materials. Just make sure your Mac has a Mini DisplayPort for it to talk to each other.